Crafted with premium, textured leather, the women’s ‘Metropolis’ bag from Italian makers of luxury leather accessories boasts a fold-down top construction secured with the brand’s signature push-lock fasten in gold-tone metal. 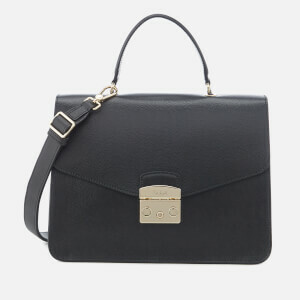 The flap lifts up to reveal a tonal grosgrain-lined interior with a slip pocket within. 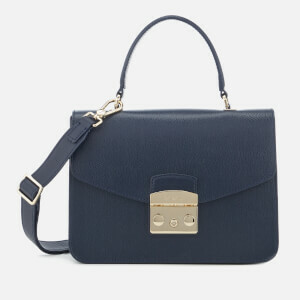 Carried via a single top handle and detachable cross body strap that can be adjusted in length, the compact handbag is complete with logo-engraved hardware and tone-on-tone stitching throughout. Dimensions: H: 16cm x W: 23.5cm x D: 7cm. Handle Drop: 9cm. Strap Drop: 56cm.